High Yield Reinforcing bar BS4449:2005 in diameters 10mm to 40mm. All fabricated rebar conforms to BS8666:2005. 8mm and 50mm are non preferred sizes that may be available on special order. Reinforcement to be formed to a radius exceeding that specified in the table below shall be supplied straight. The required curvature may be obtained during placing. For shapes with straight and curved lengths (e.g. 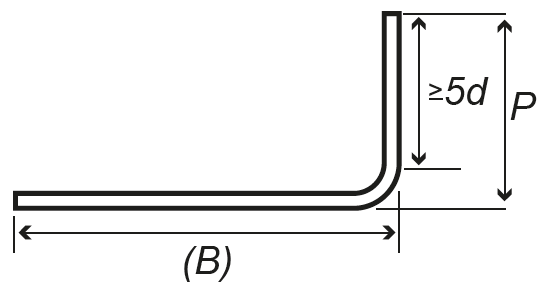 shape codes 13 and 33) the largest practical radius for the production of a continuous curve is 200mm, and for larger radii the curve may be produced by a series of short straight sections. The tolerances for cutting and/or bending dimensions shall be in accordance with the table below and shall be taken into account when completing the schedule.